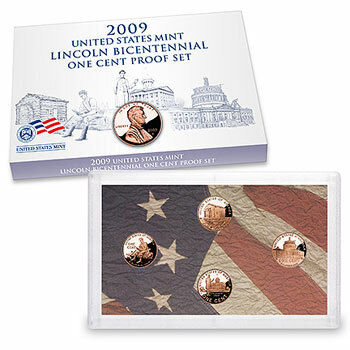 Today, August 26, 2009, the 2009 Lincoln Bicentennial Cent Proof Set went on sale at the United States Mint. This set includes the four different 2009 Lincoln Cent designs with a proof finish, struck in a special composition. To celebrate the Bicentennial of Abraham Lincoln’s birth, four different designs are being used on the 2009 Lincoln Cent. Each design is representative of a different stage of his life. The four designs feature his Birthplace in Kentucky, Formative Years spent in Indiana, Professional Life spent in Illinois, and his Presidency in Washington, DC. The 2009 Lincoln Cent Proof Set contains all four designs struck in proof at the San Francisco Mint. Proof coins are manufactured through a special process, which produces coins that are extraordinarily brilliant with sharp relief. The cameo proof finish features mirrored background elements and frosted raised elements. The proof cents are also struck in a special composition of 95% copper and 5% tin and zinc. This is the same composition used when the Lincoln Cent was originally introduced in 1909. The composition is being used for certain Lincoln Cents included in US Mint issued sets. The US Mint has priced the 2009 Lincoln Bicentennial Proof Sets at $7.95 each, with an ordering limit of five sets per household.